It's been hard to keep up with all the crime on the West Side today, as reported by the Chicago Breaking News Center. I quickly made a map using the Tutor/Mentor Connection (T/MC) Online Program Locator. It's interactive and free - and helps me visualize resources and programs that work to mentor "at-risk" youth now, so that in a few years, when the kids are old enough to potentially mug someone on the Green Line to Oak Park, or faced with gang members that offer to put guns in their hands, more of them might have better career prospects and decision-making skills... and opt against crime and murder. Once again, the news shocks us with the problem today. At T/MC, we're creating tools that work for the solutions. Feel free to click and expand the map I made in minutes this afternoon, using the Online Program Locator (although, admittedly, I did use Photoshop to put the numbers on the map... we're looking for sponsorship and donations to improve functionality of this free, not-for-profit community tool. Email me with leads.). Kevin Simms, 18 "found shot several times on a West Side sidewalk Friday evening," in the Austin neighborhood on Chicago's West Side. A 13-year-old was shot in the knee, and 18-year-old Daniel Crockett was shot dead in Lawndale/Garfield Park. The "teens were walking on the sidewalk when a dark-colored vehicle drove up, a person got out and fired shots at them." "A 22-year-old male was shot in the leg" and 19-year-old Timothy McCampbell was found dead when "police responded to shots fired" in the Humboldt Park neighborhood. Each tragic. But the "rest of the story" has hope. See, others like YOU and me are volunteering and donating to mentor programs (represented by those green stars on the map). These programs work with young kids in high-poverty/high-crime neighborhoods, and prepare them to choose a path toward a healthy future - school, career, responsibility, self advocacy, and participation in community... versus the streets, gangs, and violence. ... and "Isn't this their parents' jobs!?" Well, a lot of kids clearly don't have adults in their lives putting them on a path to a safe and secure future, like you may have had. It's your community, your safety, and your economy/taxes. The reality is that you can do something proactive instead of waiting for the school system, "their parents," or someone else to suddenly "do a better job" taking care of you. Yet I agree - it is nearly impossible for you or I to make a difference alone. Fortunately we all know people who care! Use the worksheet above to organize your network and find people who also understand this dilemma, and want to do something proactive about it. Direct them to the Tutor/Mentor Connections to learn more! Together, we can create a movement of caring people with the resources to volunteer, sponsor, nurture youth through mentorship today, so that we all live in safer and more prosperous times together, down the road. The Rest Of The Story: "Girl, 7, critically injured in Southeast Side shooting"
This evening at 5:02pm, I saw a "Sun-Times Media Wire" report: "Girl, 7, critically injured in Southeast Side shooting." The girl was shot at 4:13 p.m. at East 80th Street and South Manistee Avenue, according to police News Affairs Officer Veejay Zala. The 7-year-old girl was taken to University of Chicago Comer Children's Hospital in critical condition, Fire Media Affairs Dir. Larry Langford said. The girl was reportedly shot in the head, according to a source. Calumet Area detectives are investigating. I decided to see how long it would take me to map the crime location... with a dream in my head about a day in the future where The Sun-Times or another media outlet would want to include a map that showed which resources and which mentor programs were available near a crime scene... revealing those working to SOLVE crime in the high-poverty neighborhoods they routinely feature. Click on it to expand it if you want. But there have to be people like me and you who simply want to know how we can get involved and help solve a problem when we see one. That's not editorializing. That's providing information. 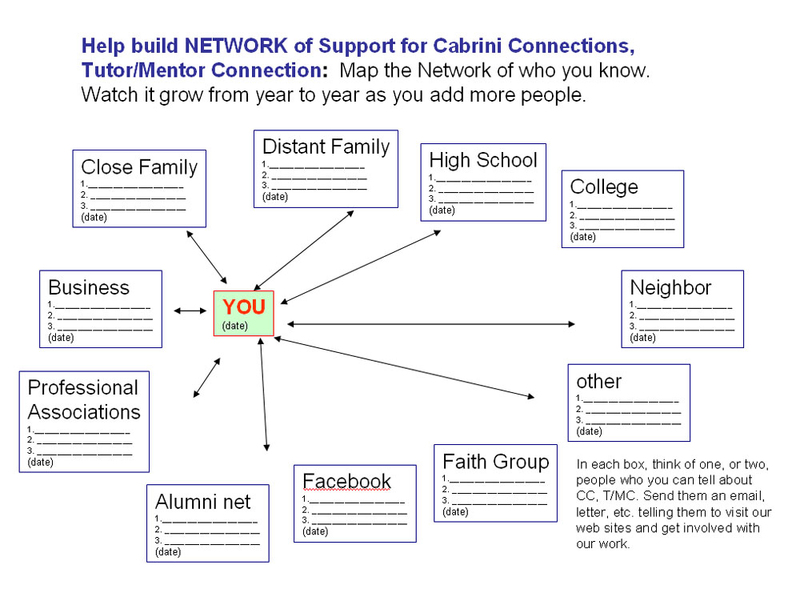 With sponsorship and collaboration, we here at Tutor/Mentor Connection could further develop our infrastructure and show an even clearer, mappable, picture of community resources available to people working (or needed) in these neighborhoods, and to those of us who want to help. We just need you to get involved and use it. And please do not kid yourself by thinking you live far away from "that sort of thing," and that "those people" are not your concern. Find a few minutes to read about how violence and other "costs of poverty" affect you, the taxpayer. It's no wonder politicians on both sides of the aisle, alongside business leaders like State Farm Chairman and CEO Ed Rust have done their research and are convinced that mentoring is something that needs to be in the middle of any plan of attack against senseless crime... and the suffering that continues to bleed down to us all. Last week, I showed a new map that features "failing" elementary schools in the Chicago area. Of course, "failing" elementary students eventually graduate to high school. If they are still living with challenges related to poverty and struggling schools, they might still be lagging behind academically, unprepared to find jobs, and "at risk." Unfortunately, many others will be looking to the streets or to you and me as they enter adulthood. 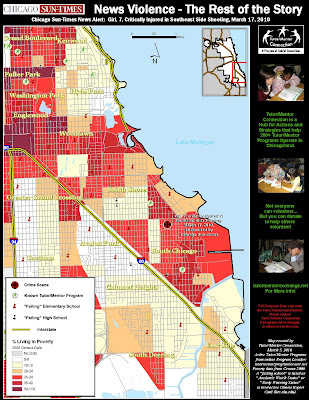 Click on this map above to expand it and see newly-released "failing school" data from 2009, poverty data from the last census, and the known locations of currently-operating Tutor/Mentor Programs in Chicagoland (data that the T/MC hosts and offers to the public for free on its website). The focus is on high schools in this map - specifically, high schools that aren't "making adequate yearly progress" according to state and federal testing standards. The map above also shows known locations of tutor/mentor programs that are equipped to help high school kids who want an extra edge to compete for a better life for themselves, their families, and our communities. Like last week, I ask you to expand the map and explore patterns between poverty and high schools. Where is the high poverty? Where, in relation, are clusters of poorly performing schools? How many (or few) programs are available in the neighborhoods where these conditions exist? Keep in mind that you aren't looking for a one-to-one relationship of schools to programs here. Each high school has hundreds if not thousands of students. Each mentor program, in contrast, likely serves only a fraction of that total. 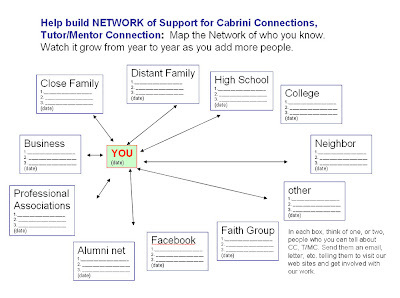 You can also take a few minutes and let business leaders, faith leaders, and political leaders in your network know about these maps and the strategies at Tutor/Mentor Exchange. Together, community leaders and Tutor/Mentor Connection can collaborate on building new programs, while helping existing programs thrive. To learn more about volunteering, collaborating, or making a donation to this cause, please take a look at the Tutor/Mentor Exchange website. Terry Edlin of the New Community Vision Cooperative quoted Einstein in her piece on Education in in The Chicago Examiner yesterday, arguing that "you can't solve a problem at the same level of mind that created it." In other words, we can't count on the government to fix our education crisis in America. After years and years of failed policy like "No Child Left Behind," they just seem to make things worse. We also shouldn't "expect schools to pick up the slack for parents who are stretched very thin." Pointing fingers at both of them, as so many like to do, has not been effective either. Terry proposes that we need to "begin to think of creative ways to support our communities." Edlin cites education historian Diane Ravitch, who theorizes that "Poor children… simply face too many problems outside the classroom. If you don’t buttress whatever happens in school with social and economic changes that give kids a better chance in life and put their families on a more stable footing, then schools alone are not going to solve the problems of poor student performance. There has to be a range of social and economic strategies to support and enhance whatever happens in school." Tutor/Mentor Connection (T/MC) promotes tutoring/mentoring programs as one such "creative buttress," and Mapping For Justice makes maps that help identify where T/MC mentoring strategies might need to be further explored by community leaders... to build new and better Tutor/Mentor Programs, and help "give kids a better chance in life and put their families on a more stable footing." Coincidentally, I've been working on some new maps, using newly-released "failing school" data from 2009, poverty data from the last census, and the known locations of currently-operating Tutor/Mentor Programs in Chicagoland (data that the T/MC hosts and offers to the public for free on its website). Look at the map above to explore patterns between poverty and elementary schools where students are not making "adequate yearly progress" according to government testing policy. Where is the high poverty? Where, in relation, are clusters of poorly performing schools? How many (or few) programs are available in the neighborhoods where these conditions exist? We can easily assume that the total number of students attending the number of public elementary schools in this map far exceeds the capacity of the mentoring programs known to be currently pairing volunteer mentors with elementary school aged students. If you are open to the possibility that mentoring might be a valuable component to any comprehensive plan of action to increase student learning... and that mentoring can help ease the cost of poverty to tax payers... and that the future of our city's economic and social health need creative and fresh solutions to these problems... then it should be a no-brainer! Head to the Tutor/Mentor Exchange website and learn how you can get involved or donate to this cause.